For a fast recipe this packed a lot of complex flavour. I was a bit pressed for time when dinnertime came around today. I was working from home this afternoon while a worker completed some stuff around the house – and he finished later than expected. I then had to walk Henry, shop for something nutritious AND get it on the table for 6pm. You would think “so what if it’s not 6pm?”. Unfortunately that seems to be the magical time that lets you eat and have enough time to work in the evening if you need to. And we still need to. We’re on the home stretch of tasks to do around the house before going on the market. But we're closer every day. And I did make 6pm. I believe it was thanks to this recipe more than to any great skill on my part. I have shown how to make gnocchi by hand in a previous post. They’re quite labour intensive – but very impressive. 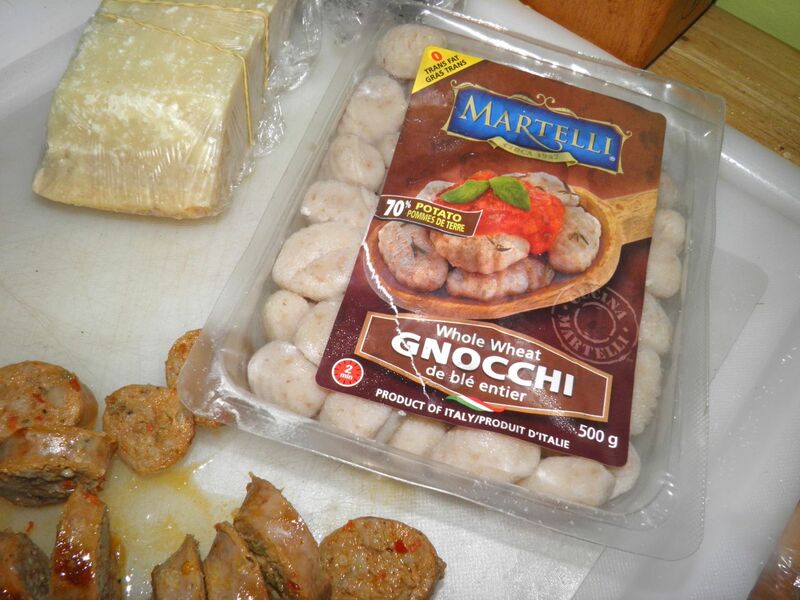 I discovered that the local bulk food store sells a gnocchi in a vacuum pack that is more than passably good. It’s also “on the table” in just a couple minutes. I happened to have a package in my refrigerator. There’s only one problem—if you can say that— with serving gnocchi. There’s usually very little “substantial” in the way of other ingredients that can really round it out to a one-dish meal. It’s usually a first course. I had to show you this. 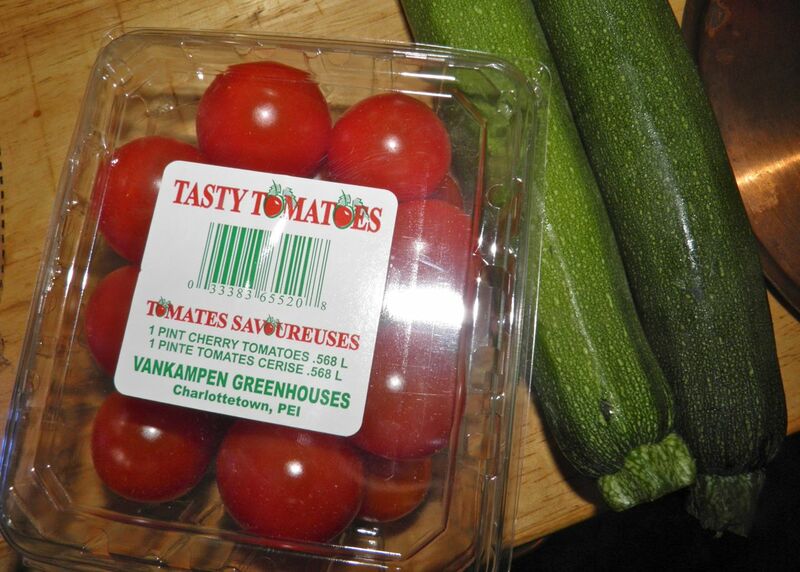 The brand of tomatoes is "Tasty Tomatoes". One would hope so. Who wants bland tomatoes? In other words, it usually isn’t combined with meat. I had found a recipe that sounded interesting. 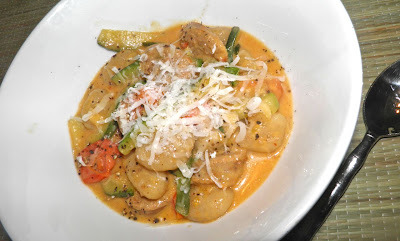 It was gnocchi tossed with butter, just-cooked tomatoes and ribbons of zucchini. But no meat. But as soon as I tasted the sauce I knew it would be a marriage made in heaven. 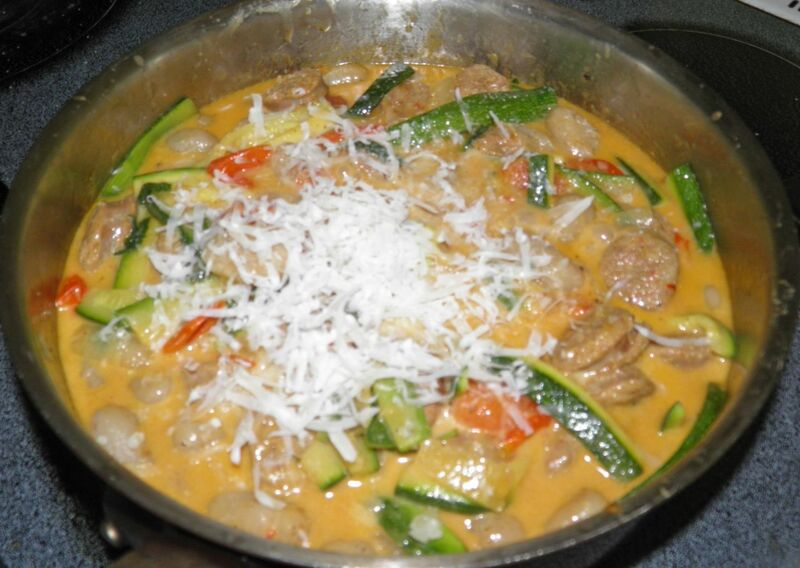 Garlic, cream and basil is wonderful with both sausage and gnocchi. It was quick, tasty and filling. I believe it all was ready in about 20-25 minutes, and I had a pause in there while I heated water for the gnocchi. Give this a try. At the very least try those gnocchi. In Halifax you can buy them at the Bulk Barn. They’re really good. Almost one pot. You have to boil the gnocchi separately. Bring water to a boil in two separate pots: 1/2 inch in a wide saucepan for the sausage; a full pot (salted) to boil the gnocchi. Boil the sausage until the water evaporates. Then add the butter and let the sausage brown slightly. Remove to a plate and then slice. Add the onion and garlic to the butter and sauté until slightly softened. Then add the cream. Let it boil and reduce somewhat. Then add the tomatoes and sausage slices. Let it cook until the tomatoes begin to soften. Cook the gnocchi according to package directions (about 3 minutes). Add the zucchini to the cream sauce and let cook for a couple minutes, while the gnocchi boil. Drain the gnocchi and add to the sauce. Add the chopped basil, salt and pepper to taste and toss. Sprinkle with freshly grated parmesan at the table. You can also add a little to the sauce. I usually do with pasta sauces.